We value our clients' experience at Pedley Square Veterinary Clinic. If your pet or animal is currently a patient, please feel free to complete the following Client Experience Questionnaire. The Questionnaire is in Adobe Acrobat format, and requires the free Acrobat Reader to view. Everyone (at Pedley Square) takes great care of all of their patience and Logan just loves them. He has health issues and they all are understanding and we love them for it. (Pedley Square) Staff & Doctors are are friendly, helpful and seem to really care about our "children". Very kind and caring. I have been coming to this office for over 20 years and they have always been professional, pleasant, and caring. They have not only been taking care of my animals but I have had to put down multiple animals in that time. Having someone with compassion at a time like this is important and they have always been just that. Thank you Pedley Square doctors and staff. Brooke F. 9/6/15 - Have been bringing my pets here for a couple years now and am always happy with my visits. The Dr is always professional, along with the staff. My cat was a regular for awhile as he was battling one type of infection after another, and they were always accommodating and loved my big goofy trouble making cat- he was quite the celebrity, (unfortunately for me!)... But was nice to know that they genuinely enjoyed seeing "petme", they even performed a surgery on his eye quite flawlessly, and to this day we are lucky to have a healthy (knock on wood) kitty who can still see out of both eyes. I'll continue to return to this facility for all of my future pet health needs. They take amazing care of our furry babies and the two times we've had to say goodbye to our little ones the entire staff was loving and empathetic. I have been with this clinic (Pedley Square) for over 30 years. Found them "accidently" when we had moved here from OC. We've been through births, deaths, and everything between. Still my "go to place". Compassion is the word that comes to mind. Trust is my next one. Everyone (at Lincoln Plaza) is so kind and professional and caring. I appreciate how you are considerate of not only giving my pets the best care but keeping the cost down. I never feel like you take advantage of the situation and over charge me. Thank you for always doing such an excellent job with my 2 dogs and rescue kitten. I feel very secure leaving my dogs in the capable, loving and trustworthy hands of the staff at Lincoln Plaza Vet Clinic. Went in (to Moreno Valley) on a hectic day, and had to wait longer than anticipated but it wasn't a bother to me. The staff was really friendly and did their best to keep it together. I believe her name was Ashley (at the front desk, has long brown hair) was very friendly and so was the vet assistant (Mia) who attended my dog and I. She definitely made my visit a pleasant one. 4 starLincoln Plaza Vet Clinic is the only place i actually trust other than Yorba Regional ..everyone is very friendly as well. Heather B. - 8/15/2015 Thank you so much for the care you showed to my dog and myself during a very difficult day. You made my dogs last day on earth very peaceful. You were very understanding and treated me with the utmost respect. I am making you my vet now. Thank you again. The doctor did a very thorough exam on my dog's back and gait. She and the tech were very pleasant and listened attentively as I told my story. I came to get a referral for the chiropractor that works with the clinic (Pedley Square Vet Clinic). I am so happy I found this vet. Holistic medicine works! I have two pitbulls bring them here (Pedley Square Vet Clinic), I think this place is great all around. The prices are very reasonable and the care is excellent from what I have experienced. I started going there after trying other vets in the Riverside area, these guys have been by far best experience for me and my fur babies. Emma T. - 6/7/2015 - After saving our boy from a certain death next door, we took him straight to the (Moreno Valley Animal) clinic for shots and his chip. 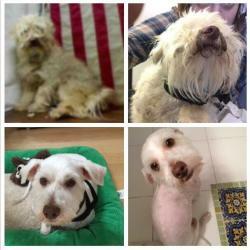 Our dog was so severely matted and uncomfortable, so it wasn't ideal having to wait over an hour to get taken care of before I could get him a good shave and bath, however... The staff is beyond wonderful. They gave my boy water (even though he didn't drink it) and were so sweet when handling him, and me!! They made the experience so much nicer than what it could have been, especially for a first time shelter-visit for me. Sunshine is a Godsend! She held our dog like a baby and treated him as if he were her own. She made me feel so much better about everything and calmed both of us down. She even sent us to her incredible groomer (the Doggie Day Spa, which I'll be giving an incredible review of shortly!)! I wish she were at a clinic near us (we live almost two hours away). I can't thank her enough for everything she did for us. Unfortunately when my boy had his chip inserted, the matting on his coat was soooo bad that the chip didn't go in all the way! Not the clinic's fault of course. I really want to give this place five stars, but the place itself could use a makeover, more help, and a more comfortable, clean waiting area. It would be impossible to have the place any other way at the moment as they have so many animals coming and going. However, the staff here deserves 10 stars!! Thank you, Sunshine!!! You changed this dog's life for the better!!!! Made the hard decision to put my beloved TJ to sleep today. I prayed specifically for kind people to help guide and counsel me through this process. Could not have asked for a better group of loving people! at Lincoln Plaza Vet. So pleased with this team. I must have made about 15 phone calls to different vets about getting my baby spayed. She's 3 a mini poodle mix I suppose. I'm a nervous momma. So some one at work recommended LPVC. I called, spoke to Ursula, she was very informative and seemed pleasant. I came in 10 minutes after I was supposed to be there. No mention of my tardiness was made. I appreciated that as I am notoriously late to life. =) I waited so long to get her altered because the idea really does freak me out. So I dropped her off when they took her back she didn't want to go. My fault she is spoiled and attached. One of the girls saw me get a little watery eyed, because I am a weenie, she said she will be fine. It is better for her. I said thank you and left. Picked up later and today she seems to be recovering slowly but surely. I will be scheduling my other little girl next month. Also my best friend will also be going to spay his 5 month old little pitbull. Thanks guys I truly appreciate you all!! I have been a client of Pedley Square Vet Clinic for well over 25 years and long before the doctors there now were working there. My ex husband and I had a dog kennel and Dr. Becky was our vet. We divorced and I have remarried and Pedley Square Vet is the only vet I will use for my animals. They take extra care with you and your animal while explaining the animals needs. Dr. Bridgett Bellinger is a wonderful asset to the company and has found both medical problems with my dogs that hadn't been going on very long. Now two of my four dogs take medication and are looking like their old selves again. Thank you Pedley Square Vet for your wonderful service to the community. You are the only vet that I refer my customers from Petsmart to when they want a reliable, honest and trustworthy clinic to take their animals. They (Pedley Square Vet Clinic) are so caring and you can tell they love their patients. Prices are very reasonable and they give you treatment options. Very little wait time too. I love this place (Pedley Square Vet Clinic). My puppy is always welcomed with lots of love! After she was hit by a car they took her into surgery right away. She loves everyone here and always thanks them with lots of kisses. Thank you to everyone that works here!! ~~We brought in our new puppy for their cheap vaccinations (Moreno Valley Animal Clinic). We got there at 7:30, the clinic opened at 8, and we had to wait over an hour. But it was worth the wait, the vaccinations were super cheap, probably the cheapest in town, and everyone was friendly and helpful. The second time, I brought my cat, (not the same one) because she has a sore. Dr. Sangl was awesome and very helpful. She thought it was fleas, and turned out she was right. The last time I was there was unfortunately to put down our old dog who couldn't walk. They offered to help us carry him in (he weighed over 100 pounds!) then they let us wait in a room by ourselves until it was our turn. The vet techs and and Dr were super caring and loving through our ordeal. They let us stay with him as long as we needed. The prices are great. I am so glad to have a good review for them. We will be going back! If only they took care of reptiles! ~~Dr. Alice is an excellent veterinarian (Lincoln Plaza Veterinary Clinic). Have taken my pets to her for about 13 years. I just love everybody (at Pedley Square Vet Clinic). Not only are their prices reasonable, but their staff is exceptional! They treated my animals like family. I have had to get my dog several tumors removed and they were just awesome. Thank you surgeons and nurses! I came home from work one day and noticed my dogs foot was hugely swollen. Wasn't sure if it was broken or infected or what. I called the office and they were able to squeeze me in with the hour. Took her down, got her fixed up and took her home. I was so thankful that they were so helpful and able to see her on such short notice. THE VERY NEXT DAY, I got home from work and my OTHER dog (I have three) was not putting any weight on his leg. I again called them, saying "you're not gonna believe this.." And explained the situation with my other dog. Again, they were able to squeeze us in with only an hours notice. Turns out he had broken his radius AND ulna. What are the odds?! The staff at LPVC were nothing short of miracle workers. They really went above and beyond to make sure that my animals were taken care of. I am so thankful for them and recommend them to ANYONE in need of veterinary care for their pets. Thank you Dr. Alice!! Thank you Lincoln Plaza Vet Clinic!!! We are very grateful to Dr. Alice, Dr. Sanders and the staff for taking good care of our pets. We have recommended Lincoln Plaza Vet Clinic to all my friends who care about their pets' health. Love the staff (at Lincoln Plaza Vet Clinic). Dr Alice is AWESOME. . Thank u for taking care of all the Belson clan. Dr. Alice and staff are great, nice & professional! We have been taking our fur babies to Lincoln Plaza Vet since 1995. I will never go anywhere else! ~~Had a less than enjoyable experience at another veterinary clinic in the area so I decided to bring my 8-week old Great Dane boy here to Pedley Square Veterinary Clinic for a second opinion. The difference between the two facilities was night and day. The front desk staff was friendly, and helpful both over the phone and in person. Loved that my pups name was incorporated in print all over the paperwork. Made us feel special and at home with them. Our nurse was efficient and very friendly as well. The doc was amazing. She was more than informative. Took her time with my baby and never made us feel rushed like we did at the other vet. She explained everything to me in detail. Offered different options available to treat a parasite he had and filled me in on as much info as she could about my giant breed dog. They ended up prescribing me with a double dose of meds for my guy at half the price I was quoted at the VCA Vet. This is absolutely the place for my Great Dane and I and we are so happy we were referred. I love Pedley Square Vet Clinic! Everyone here is extremely humble and they really care about the pets. This is for sure my permanent vet! ~~Great doctors and great staff! Max was operated on September 2013 for a Mast Cell tumor by Dr. Alice. Outstanding results and sincere care by all. He had his 1st dental a couple of weeks ago and I met with Dr. Sanders before the procedure and was able to wait with MAX until they were ready to clean his teeth. Professionalism in every aspect of your pet's healthcare. ~~I can't tell you how grateful I am for this clinic (Moreno Valley Animal Clinic). Saturday, my cat passed away. I took him to the clinic to get him cremated and we got his ashes back today. The staff is so kind and the price was very reasonable. We even got a paw print back with his ashes. Thank you for everything. 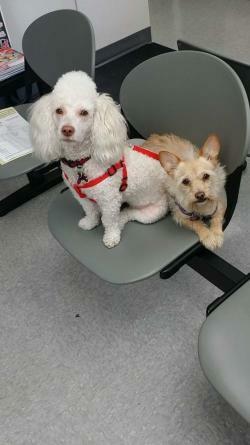 ~~We had a wonderful experience here (Moreno Valley Animal Clinic). The vet called my dog by name, spent time rubbing him and cleverly doing her exam in the process. She answered all my questions, took time to interact with my dog (not ignore him). My dog was hyped up because he is a rescued puppy and the staff here dealt with him with kindness and understanding. We are very happy with their services and will be a client for as long as we live out here. These people are the most caring I've ever met or had to take care of all my children(4 legged). They are my children because I take good care of them, both physically and mentally. I have had many strays and sick animals brought to me, I wouldn't take them ANYWHERE ELSE!!!!! I recommend Pedley Square to every one who moves in where I live and asks me about vet care I tell them if you want the BEST CARE then take them to the best, Pedley Square. Just wanted to sing high praises, to the Dr. Cox, Joann, Shawn and the staff, for the extra kind and compassionate help, my Schnitzi received..KUDOS! KUDOS! the animals and do everything physical possible to save a life. We have brought animals that have been attacked by other dogs, coyotes, bit in the face by a rattlesnake, etc. When our beloved pets were on deaths doorstep, Dr. Alice and her crew were there to ensure there was no single methods left untried to save the life of my animals. Dr. Alice and her crew save the lives of animals every day, and they continue to be passionate about what they do. I trust Lincoln Plaza Vet (Dr. Alice) immensely, and I would encourage anyone reading these reviews to consider their animals. Lincoln Plaza Vet is wonderful and will do absolutely anything within their capabilities to keep our pets safe. You all are awesome. Lily and I and the 11 puppies are very thankful to have our friend recommend you all. Godbless you and your staff. I have been using Pedley Square Vet Clinic since I moved to the area 3 years ago. One of my dogs had a bad skin condition and Dr. Sangl knew just what was needed to make him better. She had us make some adjustments to his diet and he has been fine ever since. ALL of the staff there are wonderful and extremely compassionate! The Vets are very lucky to have such great support staff. Great all around experience EVERY ti... view moreme I go there. If you are new to the area or just looking for a new vet I would definitely recommend them. I've been going to L.P. Vet. Clinic for 24 years. Dr. Alice has always been wonderful and compassionate, even when the visit was an end-of-life event. She has given us many helpful tips and advice. The other vets were equally professional and helpful. The staff have been efficient, kind, and caring. The Vet Technicians have been super great! The staff at Lincoln Plaza are always friendly, they love animals and the vets are professional and knowledgeable and take a lot of time with my pets and discussing treatment options with me. I never feel rushed. I have been bringing my pets here for over 10 years and I have never had a bad experience. When I had to put my beloved lab down the entire office was supportive and caring. I have 3 cats and 3 dogs, so I am quite a regular. Their prices are reasonable and along with looking into various treatment options the vets are great at checking prices to make sure I know how much each treatment will be so I can make the most informed choices with my critters. I HIGHLY recommend this vet to all of my friends who live in the area. Tonya V. - 12/14/12 "Thank you Dr.Bellinger and your wonderful staff...you all are always so caring and affordable with the best care. would it be to mushy if i said i love ya?....NAH! I LOVE YA thank you for taking care of my Bear & Grace ♥"
If you want the best animal care with the best affordable prices then this is the place you should bring your pets! The staff is super friendly and the prices are cheap compared to the vets in the area. Getting shots is a quick in and out procedure, and when my sickly dog does have another issue, the veterinarians are very knowledgeable and helpful in solving it and preventing future incidents. This place and staff has been great in the last 1.5 years I have been here! Everytime I go here, there's a line (especially on weekends) that's out the door (or literally 20-40 mins wait). The staff is as nice and courteous as they can be given the packed waiting room and the best part is their prices are very reasonable! I researched and called other clinics/places around MV and this is the best so far. Only thing with shots are that they're a first come first basis given popularity. Go on a weekday - it won't be packed. Their prices are very reasonable and their staff is friendly.